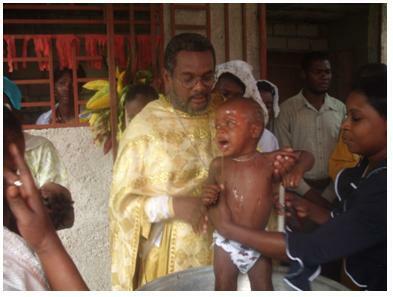 Jacmel - During his regular visit to the St. Augustine parish (Jacmel) October 9-10, Fr. 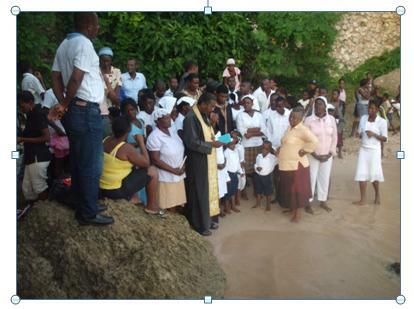 Gregoire Legoute baptized 53 catechumens at the local beach. Twelve adults and 11 young people were baptized Saturday afternoon, after which they all attended vigil. On Sunday, 30 children were also baptized: 19 boys and 11 girls. Divine Liturgy began 30 minutes after the hour because of the number of baptisms. 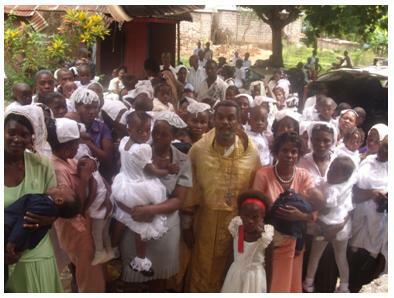 The church building of St. Augustine parish in Jacmel was confiscated by Fr. Gregory Williams, the former administrator of the Haiti mission and parish priest who left ROCOR after the restoration of Eucharistic unity with the Moscow Patriarchate in 2007. Parishioners who stayed with ROCOR currently gather for prayers under tarp. The mission recently bought a piece land in Jacmel where they plan to build a Russian Orthodox-looking church. The land has been blessed by His Eminence Bishop Michael of Geneva and Western Europe during his pastoral visit in August. The St. Augustine community in Jacmel is comprised of over 600 faithful, 450 of which are very active in church. The community needs a school, health center, houses for parishioners and a water purification system.